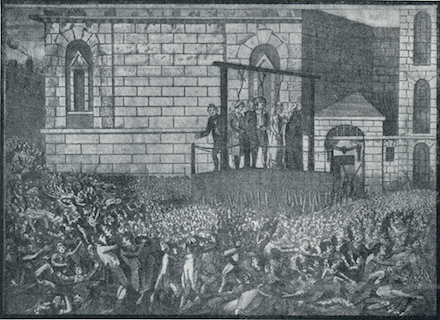 On this date in 1807, John Holloway, 39, and Owen Haggerty, 24, were hanged outside Debtors’ Door at Newgate Prison for the murder of John Cole Steele five years earlier. They died alongside murderer Elizabeth Godfrey, who had stabbed a man. Steele was 35 at the time of death and was noted for his “amiable character.” He had a warehouse in London and a lavender plantation in the country at Feltham, and business was going well. On Friday, November 5, 1802, he set out from his London townhouse to Feltham. He didn’t say exactly when he was coming home, but it was his wife’s birthday on Sunday and the family assumed he’d be back by then. He didn’t arrive home by Saturday, and everyone figured he’d stayed overnight at his plantation. But when he missed his wife’s birthday party the next day, they got worried. On Monday they sent a messenger to investigate. Steele, it turned out, had arrived in Feltham, and by 7:00 Saturday evening he was ready to return to his London house. He wasn’t able to procure a carriage, however, and decided to walk across Hounslow Heath, then a notorious haunt of bandits and highwaymen. It was not the sort of place a man with money — Steele was carrying about 26 shillings on him — should be at night. He had paid for his want of caution with his life. Searchers subsequently found Steele’s bloodstained coat on the heath, in a gravel pit ten or fifteen yards off the road. His corpse was under a clump of trees in a ditch 200 yards from the road. It had not been buried, but turf had been laid over it to conceal it. He’d been beaten and strangled to death, and the leather strap used to choke him was still tied tightly around his throat. His boots and hat were missing, his pockets had been cut away from his clothes and all his money was missing. Letters were sent to justices in Rutland and Leicester, urging that the most strenuous efforts should be made to apprehend [suspects], but they were never found. Steele’s family placed an advertisement in the newspaper offering a reward of £50 for information leading to the capture of the murderers. Several known criminals were arrested on suspicion, but after questioning they were released. Four years went by and all hope of finding the guilty persons was gone. In 1806, 26-year-old thief Benjamin Hanfield was sentenced to seven years’ transportation. 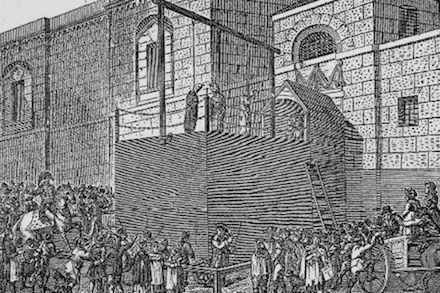 While awaiting transfer to a convict ship to take him to Australia, he mentioned Steele’s murder to some other prisoners and said three men were involved in the slaying. Word got around to the authorities, and they took him to Portsmouth by coach for questioning. He implicated John Holloway and Owen Haggerty. It had been Holloway’s idea, he said; he’d somehow found out that a gentleman with money would be at Hounslow Heath on Saturday, November 6, and had recruited the other men to help him commit a robbery. The three of them went to Hounslow Heath that Saturday, as according to plan, and waited for Steele. When Hanfield accosted their mark and demanded money, Steele was cooperative at first, handing over his cash. But when the robbers demanded his pocketbook as well, he claimed he didn’t have it and begged them not to hurt him. 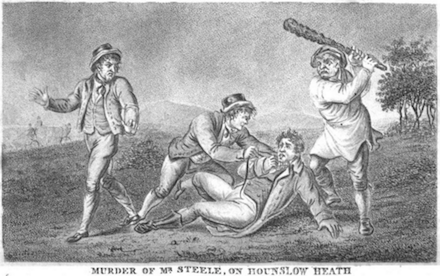 Holloway struck him with his stick, and as Steele began to struggle, Holloway said, “I will silence the bugger,” and beat him several times about his head and body. They left him lying dead on the heath. Hanfield ran away first, ahead of the others. He waited for nearly an hour at The Bell public house for them to catch up. After his accomplices arrived, they all went to an inn, the Black Horse. It was midnight and inn was closed for business, but its proprietor was still awake and the three men convinced him to serve them. They shared half a pint of gin there before parting ways. Hanfield’s story had some evidence to support it. While he was being transported to Portsmouth for questioning, the coach passed the place where Steele had been killed and Hanfield pointed it out. After confession, he was taken back the heath and pointed out the clump of trees where Steele’s body had been located. This was enough to get Holloway and Haggerty arrested. Both men, when apprehended, said they were innocent. By December 8, Haggerty and Holloway were brought together and Hanfield’s statement was read to them. The two men denied knowing each other, denied any knowledge of the murder, and denied having ever been on Hounslow Heath in their lives. Hanfield’s story had another problem: he said Holloway knew well in advance that Steele would be on the heath that fatal Saturday. But, although Steele visited his Feltham plantation regularly, he didn’t have a fixed day of the week for doing it, and his own family wasn’t sure when he would be returning when he left London on Friday. But in spite of the discrepancies, the flat denials from the alleged accomplices, and the lack of evidence supporting Hanfield’s statement, the authorities were sure they had the right men — tunnel vision that presents in many wrongful convictions. Hanfield was granted a free pardon for turning King’s Evidence against his co-defendants, and his previous sentence of transportation was commuted. At the trial, he was chief witness for the prosecution. The defense argued that Hanfield was a liar and a professional criminal who had implicated innocent people for personal gain. But the defendants could not prove where they had been on a random autumn night five years earlier, and both had clearly lied about being strangers to each other. Multiple witnesses testified that Haggerty and Holloway had known each other for many years. One of those witnesses was Officer Daniel Bishop, who worked at the jail. The two prisoners had been placed in separate cells side by side, and the partition between them was so thin that they could easily converse with each other. This had been a trick, and Bishop had been hiding in a nearby privy, writing down everything they said. From Haggerty and Holloway’s conversation it was obvious the men were good friends. That much was true. But it was also true that when they thought they were alone together, neither of them implicated themselves in Steele’s slaying, and in fact they said Hanfield was a liar and that he, and not they, should be hanged. The verdict, nevertheless, was guilty, after fifteen minutes’ deliberation. The sentence was death. 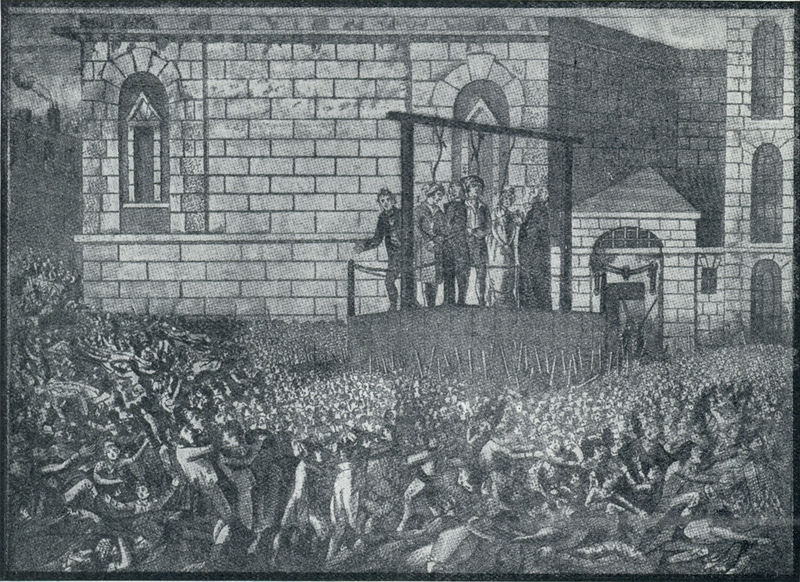 Gradually the mobs dispersed and the bodies, thirty in all, were taken up in carts, twenty-seven to Bartholomew’s Hospital, two to St. Sepulchre’s Church and one to The Swan public house. Numerous others were injured, including fifteen men and two women who were so badly bruised that they were taken to the hospital, one of whom died the following day. As it turned out, the landlord of The Bell didn’t remember any strangers coming to the pub on the night of the murder, and the landlord of the Black Horse didn’t remember three men coming at midnight and asking for gin. There were no details of the murder in Hanfield’s confession that he couldn’t have learned from common gossip. Furthermore, he had a history of making false confessions. A lawyer, James Harmer, actually compiled a pamphlet (Google Play | Google Books) of evidence that supported Haggerty and Holloway’s innocence. But none of this exculpatory evidence surfaced until after the executions. In yet another twist, in 1820, John Ward, alias Simon Winter, was indicted for John Cole Steele’s murder. Ward had a bad reputation in the area and was suspected of robbery and livestock theft. It was said he participated in the search for Steele, and one witness said he had seemed to be trying to lead the search party in the opposite direction from where the corpse was found. The paper-thin murder case against Ward was dismissed for lack of evidence, and rightly so. But by indicting him in the first place, the authorities had as much as said Haggerty and Holloway had been wrongfully convicted. Hanfield disappeared without a trace after the murder trial; it’s unknown whether he continued his criminal ways.